Foot out, flat out! These two new shoes offer excellent platform pedal hook-up thanks to vastly improved grip and feel. Cracking into the flat pedal footwear game is no small task, as Five Ten, the longstanding champ, presents a very formidable opponent with proprietary rubber compounds derived from the rock climbing world. Specialized isn't one to shy away from a competition, however, and their new shoes will give the original ruler a run for their money. If you enjoy the foot out, flat out riding style, these casually-styled kicks are made from a variety of technical materials that add up to an impressive pair of mountain bike shoes. "In 2014, the 2FO flat was our first attempt at making a true flat pedal riding shoe with technical innovations in materials, ventilation and outsole design," Specialized told Vital. "But in our opinion, there was room for improvement. The grip was good, but not great, and the pedal feel left something to be desired. It was a good lesson in learning, so we packed our bags and headed to the Sunshine Coast in B.C., Canada to work with the Coastal Crew (Curtis Robinson and Dylan Dunkerton) to work on the new and improved shoe family. SlipNot was developed in conjunction with our tire team, and together, we went back to the drawing board and tested over 12 variations of rubber compound to get to the new SlipNot 2.0 compound. We knew it had to tick ALL of the boxes, not the standard 'two out of three,' and the result is better grip in all conditions—wet, dry, hot, cold, plus it’s more durable! The SlipNot 2.0 compound is the softest, grippiest rubber we’ve ever used. The lug pattern is also new, and it's almost as important as the rubber compound. The shape, size, spacing, and orientation of the lugs (the pattern on the bottom your shoes) dictate the mechanical grip's ability between your shoe and the pedal. We designed numerous samples to find a pattern that would conform and maximize mechanical grip." "Like the children’s book Goldilocks, there's a balance to strike between feeling too much and not enough. So guess what? We made more and more samples and did more and more testing. It took awhile, but we discovered a nice balance of being able to feel your feet and where you are on the pedals, without being so soft that your feet cramp on long descents. We did this through an EVA foam in the midsole. This foam has a huge impact on the ride qualities of the shoe. In fact, we found it had almost a bigger impact on the overall characteristics than the rubber compound. Too firm = no pin penetration, no pedal feel, and lack of grip. Too soft = cramping feet and quite often prematurely shredded rubber. To start, we had a high-tech pressure mapping system (insole) that could measure the smallest changes in pressure underfoot. This allowed us to analyze what really happened in rough sections of trail, g'ing out in turns, and even popping off the lip of a jump. With the samples in hand, we did back-to-back testing of the different densities of EVA foams (with the same rubber compound) to see how those affected grip (perceived vs. real), as well as how the shoe would react on the pedals to those forces above. After reviewing the data, we found that the EVA played as big a role in grip as the compound. The EVA needs to be soft to subsequently accept the rubber deformation due to the pins. It’s important that these two materials (the rubber and the EVA) work together for the best pedal connection." "Rocks, roots, pedals, cranks, and (insert your own shoe ruining nemesis here) are always out to try and smash your feet and break down your shoes. We thought about that when we went to the drawing board: How can we make a more protective and durable shoe? We know that flat pedal shoes get more abused than their clip counterparts, so we built in a little extra 'oomph' when it comes to protection and durability. A captured foam upper protects feet from rocks, roots, and hits. There is flat-pressed foam in the forefoot, so next time you try and do a drive-by kicking on a baby head rock, you won’t find your toe nails in your socks. Mud and cranks also seem to wreak havoc on shoes, so we've bolstered the medial protection to keep your ankles from getting smacked. We also brought in some technology from our performance shoes, which means ceramic printing a thin, transparent layer of ceramic beads to protect the shoe collar from getting shredded to a pulp." Forefoot Varus Angulation – "The medial side of the forefoot is 1.5mm thicker than the lateral. This angulation helps correct for valgus forefoot collapse, which eventually works up the chain and results in the knee falling into valgus, which often results in knee pain." Longitudinal Arch Support – "Arch collapse has similar results to forefoot collapse. The collapse works its way up the chain and causes the knee to fall medially. Our shoes ship with our 'red' insole which is our lowest amount of arch correction. While many riders will need more arch support, this ensures that all riders can use the shoes out of the box." Metatarsal Button – "This is the little bump in the middle of our insoles. This works to help spread the metatarsals apart and prevent toe numbness that may happen when the shoes are tied too tightly." Impeccable construction, great grip, and a substantial weight reduction over the previous shoe? Sign us up. 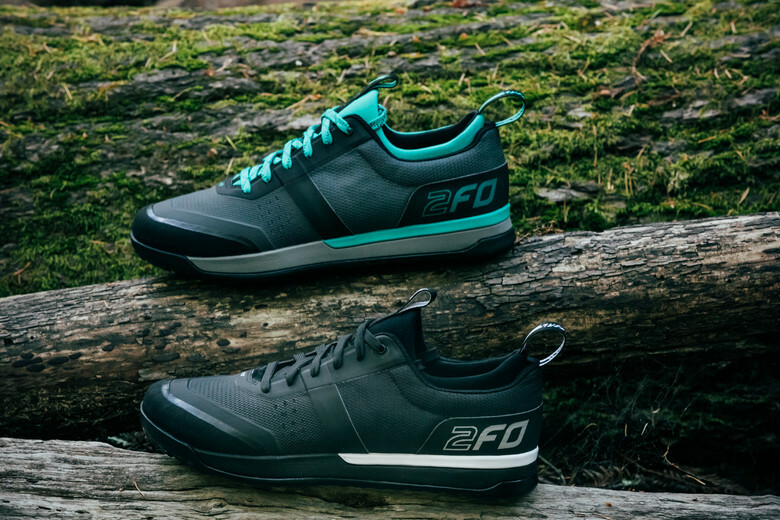 Putting the new 2FO 2.0 Flats on for the first time you'll note a roomy toe box that gives the shoe a more casual, skate-style feel known and loved by flat pedal riders around the world. This adds to the comfort level on the bike, while hiking, and long after the sun has gone down and post-ride high fives have been shared. Casual looks meld with performance throughout, and the back two-thirds of the shoe are sleek and trim much like Specialized's clipless shoes. The fit is familiar, incorporating many of the brand's Body Geometry technologies intended to create a more comfortable, ergonomic feel. Press down on the toe and you'll be pleased to find a firm toe box to protect against the odd ball rock smash. The stout heel cup offers great ankle support. We appreciate the addition of a pull tab to help get them on, and the new tongue shape eliminates the occasional digging into your ankle that previously occurred. Suitable for dry or wet weather rides, these bad boys are vented very well with perforations throughout the sides and tongue. As any flat pedal enthusiast will tell you, what truly matters is how well they grip. We have nothing but positive things to report here as Specialized has finally arrived at what we consider to be a sufficient level of grip. That's all well and good, but as any flat pedal enthusiast will tell you, what truly matters is how well they grip. When combined with Gamut's Podium pedals, we have nothing but positive things to report here as Specialized has finally arrived at what we consider to be a sufficient level of grip. Where the previous 2FO shoes lacked that superb sense of control and pedal feel with too firm of a sole, these new versions strike a nice balance for aggressive trail use. Following a handful of rides the pedal feel is excellent, and the shoes hold their purchase on the pins quite well. Though the rubber compound is soft and tacky, the grip it provides isn't overwhelming and you can reposition your foot as needed with relative ease. Are they up to the task on a downhill bike in truly rough terrain? That's something we'll find out in the coming months. 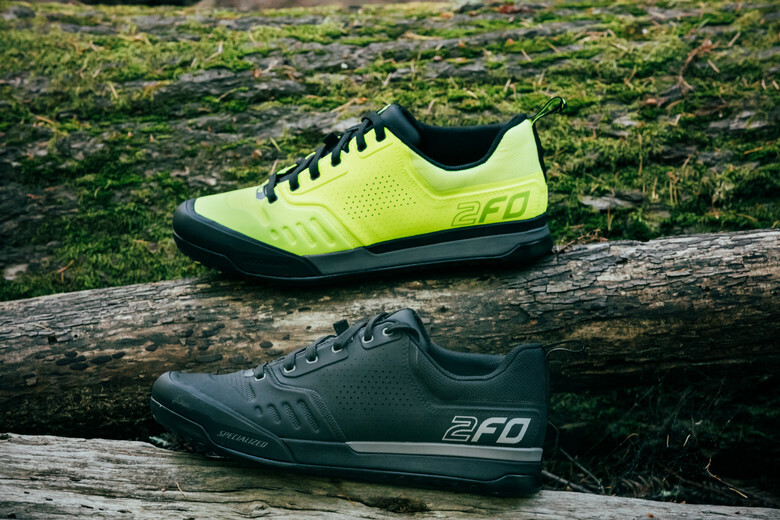 Based on our initial impressions, the 2F0 2.0 shoes are an excellent second go. Specialized has had dozens of shoes in use by athletes all over the globe to ensure the shoes work well for a large group of riders, and more importantly, that they aren’t going to fall apart. Visit www.specialized.com for more details.